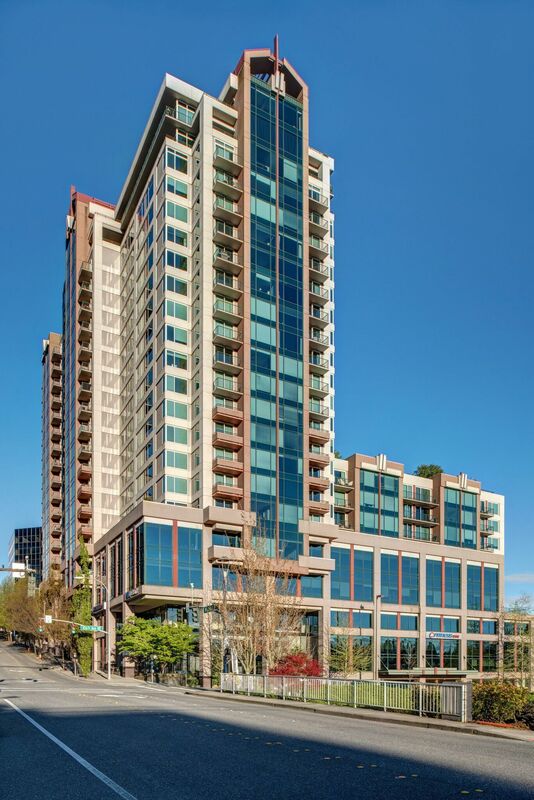 An impressive and luxurious high-rise condominium that boasts prestige and convenience, the Bellevue Pacific Tower in Bellevue, Washington presents an exciting real estate prospect for homebuyers interested in the beautiful city of Bellevue. Offering an abundance of amenities, scenic views of the surrounding city and sea, and a wealth of real estate options, Bellevue Pacific Tower offers the summit of luxury as well as convenience. Buy a new condo in Bellevue Pacific Tower and look forward to enjoying all that the great city of Bellevue offers. While the remarkable luxury and comfort of Bellevue Pacific Tower is undeniable, the available amenities in the complex and surrounding area are incredible. Bellevue Pacific Tower offers an amazing health club, relaxing roof top garden, soothing sauna and hot tub, a club room, pool, and around the clock concierge services. Buy a home in Bellevue Pacific Tower and enjoy the fabulous amenities the complex offers. The city of Bellevue has plenty to offer as well, with numerous nearby dining options, such as the delicious Lunchbox Laboratory or the exotic Wild Ginger Bellevue. Buy a home in Bellevue Pacific Tower and enjoy entertainment at Parlor Live Bellevue, or the Regal Cinemas Crossroads 8. The options are endless in Bellevue, as there are wonderful parks nearby for outdoor enthusiasts to explore, as well as abundant shopping opportunities. Bellevue Pacific Tower presents a great opportunity to make the most out of living in the Bellevue community. In addition to providing amazing amenities, Bellevue Pacific Tower grants homebuyers a first-rate living space with deluxe features and a multitude of floor plans. The condos that are available in Bellevue Pacific Tower range in size from 1,174 square feet to nearly 3,000, so homebuyers can select the unit that best suits their spatial needs. Condos in Bellevue Pacific Tower feature beautiful views, gorgeous layouts, balconies, and indisputable comfort. Buy a home in Bellevue Pacific Tower and revel in the luxury and convenience of the complex. Those interested in taking advantage of the amazing real estate opportunities that Bellevue Pacific Tower in Bellevue, Washington presents should not hesitate to contact us today for more information or with any questions they might have about Bellevue Pacific Tower homes for sale.